This article was originally published in the Smithfield Times magazine, January, 2017. One of the first paid fire fighters of the S.F.D. The Smithfield Fire department can trace its origins to the 1870s with the acquisition of its first fire engine, dubbed “The Water Witch” that was purchased from the city of Pawtucket. For nearly one-hundred years afterwards, fire stations in town were manned by volunteers, but that all changed in 1966 when it was decided that Smithfield should begin the process of transitioning to a semi-paid fire department. The initial plan called for nine firemen; a chief, two lieutenants, and six privates, to man the Georgiaville and Greenville stations from 7 a.m. to 5 p.m. The department would still be augmented by volunteers, also known as “call-men”. Reasons for the move included changing demographics. While there was no shortage of volunteers during the evening and overnight hours, during the day many volunteers now worked outside of town, compared to earlier times when people tended to work close to home. Department turnout reports for 1966 seemed to support this premise with 15 to 20 volunteers responding to emergencies during the daytime, compared to nearly twice as many on nights and weekends. For those unaware, when an emergency was reported to the fire department in 1966, volunteer firemen were “called” by the activation of the large “air-raid” sirens mounted on the roofs of the Greenville and Georgiaville stations. These sirens were extremely loud, and could be heard from a great distance. Volunteers would go to their stations and then respond with apparatus as needed. One can see how this could cause a delay in response time, and it was felt that having paid men at the stations would help alleviate this problem. One of the first paid firefighters of the S.F.D. The first paid member of the department was Chief Norman R. Segee, who was appointed November 28, 1966. Eight more firemen were appointed on December 5, and on January 1, 1967, it was officially announced that Smithfield now had a semi-paid fire department. It was also reported that three of Greenville’s firemen, Ernest Hawkins, Michael Fusco, and George Jaswell, would voluntarily sleep in the Greenville station at night to provide coverage. Five of the paid firemen were assigned to the Greenville station while the other four worked at the Georgiaville station. Those assigned to Greenville included Chief Segee, Lt. Walter Segee, Pvt. Raymond Young, Pvt. Paul Ganz, and Pvt. Raymond White, Jr. The Georgiaville station came under the command of Lieutenant Milton Corey, who oversaw Privates Fred Andrews, Ronald Paterson, and Walter Passano. Chief Segee joined the Greenville Volunteer Fire Department in 1941 while still a teenager. This was not uncommon for the time especially during World War II when older volunteers were leaving to join the military. When Segee turned 18 in 1943, he left to serve in the navy, but re-joined the department after the war, serving as a lieutenant from 1947 to 1952, when he was elected one of the state’s youngest fire chiefs. 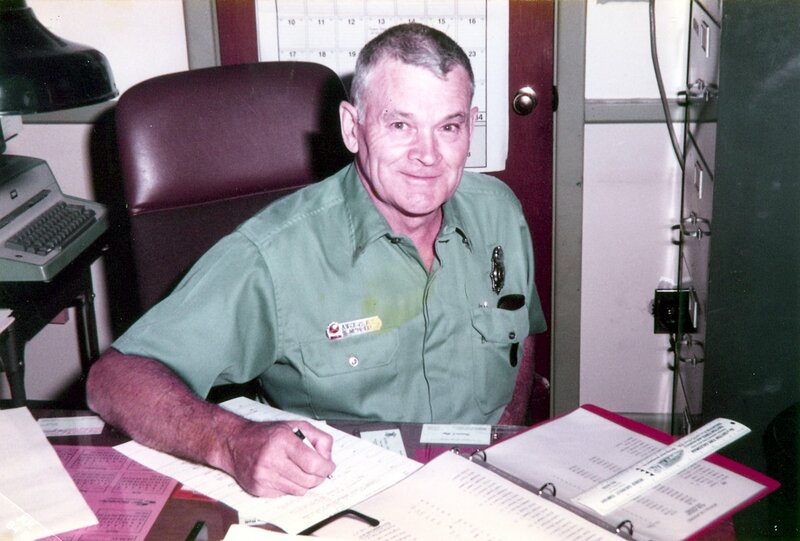 As a lieutenant, Segee was instrumental in organizing the town’s first rescue squad, and chaired a committee to install the department’s first two-way radio system, which was funded through the proceeds from Greenville’s first firemen’s carnival held at Waterman’s Lake in 1951. Chief Segee retired in 1984. All of the new appointees had been long-time volunteers. Their ages ranged from 28 to 53, and most were military veterans. Lt. Walter Segee had been a volunteer for 27 years, and prior to his appointment had been serving as the “day man” at the Greenville station while working third shift at the former Greenville Finishing mill on Putnam Pike. Lt. Corey was born and raised in Georgiaville, and had served with the Georgiaville Fire Company for 25 years, five of which he’d served as Chief. Lt. Corey retired as the Smithfield Fire Department’s Deputy Chief in 1984, after serving the town for nearly 44 years. Private Andrews was a lifelong resident of Smithfield who owned the former Andrews Farm located where Routes 104 and 295 intersect today. At 28, Private Walter Passano was the youngest of the nine appointees. He’d served six years as a firefighter in the U.S. Air Force, and had been a volunteer fireman in Georgiaville for 12 years. Private Passano eventually rose to the rank of Chief in the department. Private Young, 39, of Spragueville had been a volunteer since he was 15. Private White had moved to Smithfield from Philadelphia when he was 7-years-old, and had formerly worked for the Smithfield Highway Department. Private Ganz had been a volunteer fireman in Cranston, where both his father and grandfather had served as Chief of the Oaklawn Fire Department. After moving to Smithfield with his family in the late 1950s, he began volunteering in Greenville. 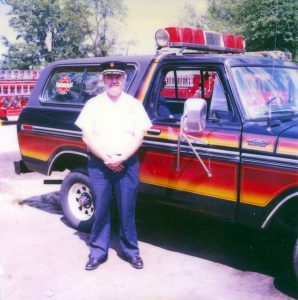 Private Ronald Paterson had been a volunteer with Georgiaville for the pervious 27 years, and he continued to serve with the fire department for many years afterwards. On January 23, 1967, about three weeks after the new semi-paid department was in place, the crew assigned to the Greenville station was called out for an unusual ice rescue. Apparently two dogs, a beagle and a German shepherd, had been playing on some ice when the shepherd fell through and found himself struggling for his life. Meanwhile the beagle ran for help, and went to a local business where his frantic barking and clawing at the door aroused attention. The employee who investigated the noise quickly sized up the situation and called the fire department. Firemen responded with a small boat and pulled the dog to safety. Once in the boat he shook the icy water from his fur dousing his rescuers, but nobody seemed to mind. Once back on shore he was draped with a blanket and given warm milk. As time went on, the number of paid fire fighters in Smithfield continued to grow as the department continued its transition from volunteer to paid. Today there are fifty-three sworn firefighters on the Smithfield Fire department.